Arrive at Jaipur. Sightseeing in the Pink City. Night halt at Jaipur. After breakfast leave for the Jaipur Sightseeing. Night halt at Jaipur. Leave the Pink cit y & proceed to Bikaner. 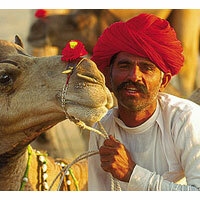 Evening enjoy camel ride. Night halt at Bikaner. After breakfast sightseeing at Bikaner. After lunch proceed to Jaisalmer. Dinner & night halt at Jaisalmer. After early breakfast proceed for Jodhpur. Night halt at Jodhpur. Sightseeing at the Blue city. Evening free for Leisure. Night halt at Jodhpur. After breakfast we proceed to Muslim Pilgrims- Ajmer. After sightseeing & proceed to Jaipur. Tour ends with sweet memories. 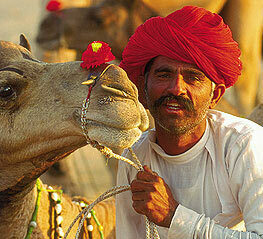 Bikaner: -Junagadh Fort, The Ganga Golden Jubilee Temple, Devi Kund, Sun Gate, Kalibanga. Jodhpur :- Balsamand Lake and Gardens, Clock Tower, Government Museum, Mandore, Mehrangarh Fort, Old Fort Museum, Bal Samand Lake and Gardens, Jaswant Sagar Dam, Khichan.